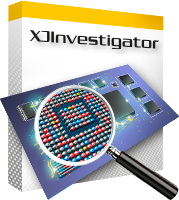 Much more than a production line test tool, XJInvestigator is a repair focused, integrated test and debug environment for fault analysis, helping you efficiently recover your failing boards. 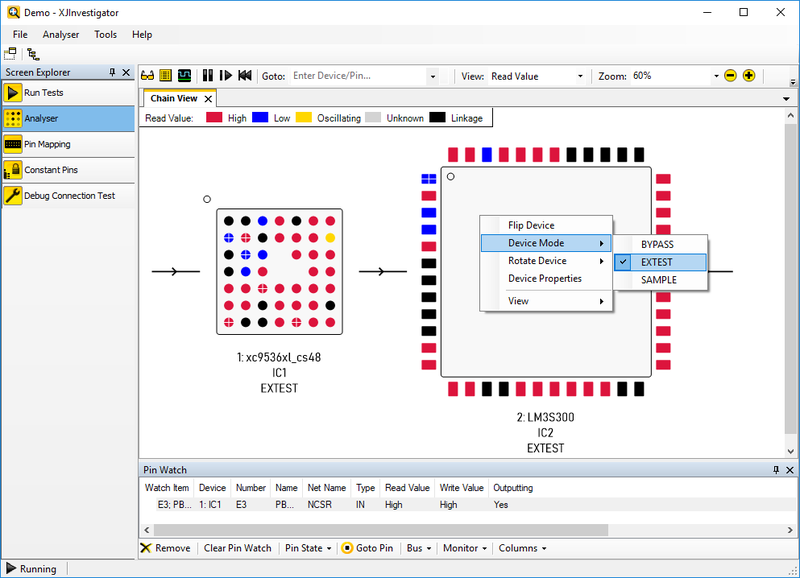 Combining the test capabilities of XJRunner and XJAnalyser with additional diagnostic functionality, XJInvestigator is the boundary scan tool to use at your manufacturing repair/rework station. Repair-focused environment for XJDeveloper / XJRunner tests. RAM, Flash and other non-JTAG device tests. Flash, FPGA, CPLD and EEPROM programming. Layout Viewer* to show the physical location of faulty nets, pins and components. Schematic Viewer* to show the circuit design around faults. Direct control of the pins/balls of JTAG devices. View pin states graphically in real time or capture them in the Waveform Viewer. Trace signals to identify shorts, opens and other faults. XJInvestigator is much more than a production line test tool, it allows you to quickly identify faults and get boards re-worked and re-tested. Not only can you reproduce XJRunner’s error reports, you can also take direct control of the pins/balls on the JTAG devices from the Analyser screen and run extra diagnostic functions not normally available on the production line. You can then visualise any fault on both the schematic and layout of the board using the integrated viewers. If the production line tests cannot be run on a board due to problems with the scan chain then the built-in JTAG Chain Debugger helps you quickly identify these faults so normal testing can continue. XJInvestigator extracts all the information required to test and debug your boards from the same encrypted XJPack file that is used by XJRunner. To ensure consistency in the testing process the predefined test functions cannot be modified however XJInvestigator offers the extra flexibility and configuration options needed to help you to track down faults. When a problem has been identified with a board you can select individual tests, sets of tests or additional functions not included in production testing to run. The tests can also be run continuously to help diagnose particularly tricky or intermittent problems. By showing both the physical and logical organisation of a board, the Layout Viewer and Schematic Viewer* can be used to help understand and locate faults. * The Layout and Schematic Viewers are only available if you opt to include the required information in the XJPack file when it is exported from XJDeveloper. Simple ad-hoc tests can be implemented very quickly by controlling and monitoring signals on the board from your JTAG-enabled devices, even BGAs. On the Analyser screen, pin values can be set to toggle or to be driven high or low. The values of pins read from the board are shown in a simple colour-coded display. XJInvestigator can scan and store the values being driven onto the JTAG devices of a known good working board. These values can then be compared with those captured from boards exhibiting unexpected behaviour to highlight inconsistencies. You can put pins into a watch window allowing you to easily establish the relationships between them, even when they are from different JTAG devices. You can also build groups of pins into busses and then write values to the busses and monitor their values for more efficient testing. 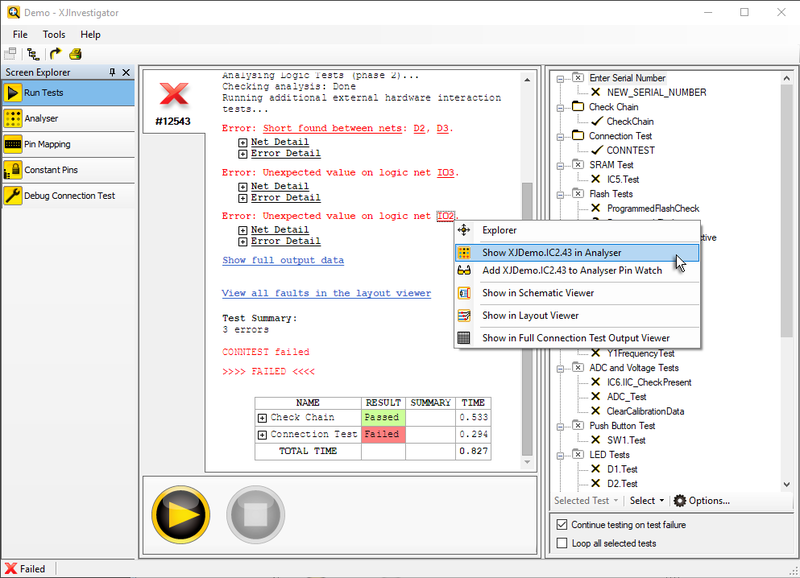 By keeping the test results visible while you are using Analyser and the other debugging features such as the Layout and Schematic Viewers, XJInvestigator’s user interface helps further streamline and simplify the debugging process.